Update: At Oct. 8, 2014 Maria Korolov published new and easier way how to log visitors to Google spreadsheet. Please try her version first. If you want to log visitors of your region or parcel to spreadsheet, it is possible even in new Google Drive. This howto is made for spreadsheets in August 2013 and it works properly. You do not need any special skills like programming or inworld scripting. Thanks to Maria Korolov, for the idea and very nice and descriptive article. Her instructions are part one. 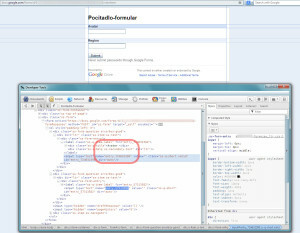 My howto explaining how to change the Google URL and inworld script to work with current Google forms. Make your new Google form as described in article, get the form URL. Read more info about script there, if you want. Download Maria’s script, if you would like to study the changes. Bellow is my complete script for your inworld counter. Before you use it, you have to change some parts of script. It is not working as is! where XXXX… is your unique ID for this form. Next part for change is explained by Maria – if you want log in your avatar. Tha last part is most tricky. All blue parts has to be replaced by your values. 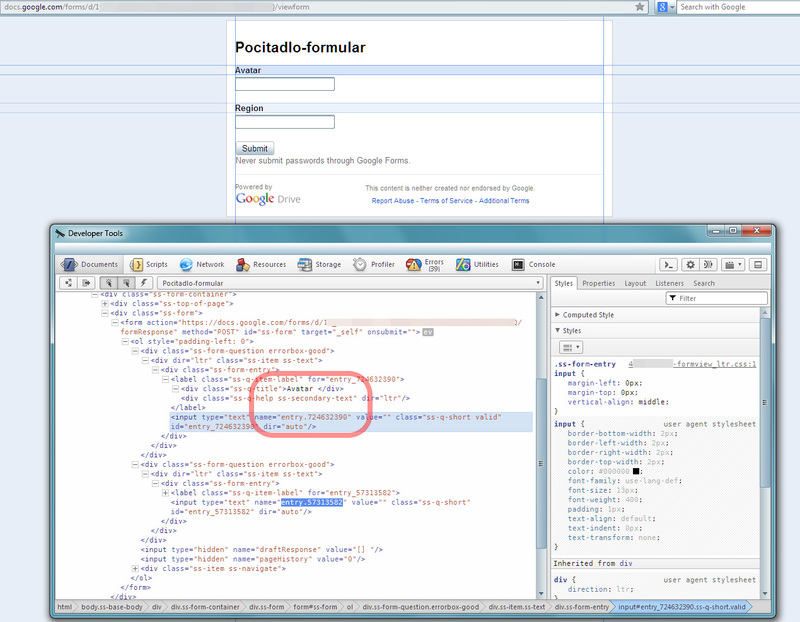 First part is before XXXX… (your unique ID), in my case "https://docs.google.com/forms/d/"
Add the rest of URL between Form ID and question mark, in my case "/formResponse"
How to find your entries IDs? For some reason Google do not use neat entry IDs like “entry.1″ and “entry.2″ anymore, but some random numbers. You can find it in HTML code of your form. On the form page rightclick on the word “Avatar” and find “Inspect element,” “Show source code” or similar option, depending on your browser. It shows the code and probably highlight the element of “Avatar.” See the picture bellow. Find the IDs of your elements and replace them in your script – "entry.YYY" by Avatar value and "entry.ZZZ" by Region value. Replace AVATARNAME and REGIONNAME by any values you choose. Insert URL into your browser and press Enter. If you get error message, you made a mistake. If your URL is right, Google thanks you for submiting your answer and you just manually insert first visitor to your spreadsheet! Download sample script. Works in OpenSim. Insert script with proper values to your object inworld. It is done. I hope this howto will be helpful. If you find very different Google form URL or if it does not work for you (and you are absolutely sure it is not your typo), let me know in discussion. 14 Responses to "Visitor counter + Google spreadsheet, update for 2013"
Seem to having an issue and this is an issue I had even with Maria’s first script. I’d get everything all set up and it’ll work manualy entering but it won’t actually log automatically from Second Life. Any help on the matter would be apreciated. Hello Rycon. There is a different version of script for SL. Did you use this version? Your description fits to the problem with OpenSim version of script in SL. I attempted to use both versions and neither one worked. Is there a specific version I should be using for Second Life? The “SL version” as above is the one for SL. I guess you double checked your numbers in code and it is still not working? Is the structure of your form numbers significantly different from my one or it is the same? i dont think so, but let me give it another go and if it doesnt work i’ll send you my code in world so we can see whats going on. hi harmar, do you use the different version of script for SL? I’ve got an idea, but not sure how to implement it. we have a device that people have to click, either they say yes or they say no. we have no way of logging who did what with it. but I know it does say “Thanks for your answer. we would like to collect this information into a google doc and found this script and we see it logs to the doc it’s self with this script. So as I am code dumb, how would one modify this to listen to specific words and log them to the doc? Is your script in Opensim starting? There is “Visitor recording script started…” in local chat, if script is running. You can restart the script in object or simply take it and rez again for restart of script. I was on the right track with Maria’s script, and had found the entry.XXXXX keys in the form just as you described, but I wasn’t quite sure exactly where they needed to go until looking at your updated code. This post answered that question for me. Thank you! I did modify a teensy bit so that the avatar and location form field variables are not hard-coded. This should make it easier for a novice to modify the script without accidentally futzing something up. // Do not edit below this line unless you know what you're doing. // Please leave any author credits and headers intact in any script you use or publish. // If you don't like these restrictions, then don't use these scripts. Not quite sure what happened to my reply. I did use the code attribute. Hmm. So, in short…. Araminta, thanks for your modification.